Put the venison into a bowl with all the marinade ingredients, stir and leave in a cool place overnight - two nights is even better. Remove the meat from the marinade and pat dry with kitchen paper. Strain and reserve the marinade. Preheat the oven to 150°C/gas 2. Heat the oil in a casserole and gently fry the pancetta until the fat runs and it browns a little. Remove and reserve. In the same oil, brown the meat in batches so as not to overcrowd the pan. Remove and reserve. Add the onion, salt lightly and cook till soft. Sprinkle in the flour and let it take a little colour, scraping up all the caramelised bits. Add the reserved marinade and the raisins, bubble up and stir over the heat until the sauce thickens and no longer smells of alcohol. Return the meats to the casserole, bubble up and add the spices, salt and pepper. Cover and put in the oven for 1½ hours, till the meat is soft enough to eat with a spoon. Add a little hot water every now and then if it looks like drying out. 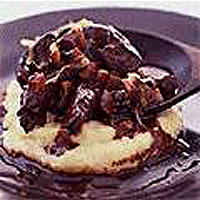 When the meat is tender, stir in the chocolate and bubble up again until the sauce is thick and shiny. Pile in a hot serving dish and finish with a sprinkle of pine nuts toasted in the oven or tossed in a dry pan. Serve with polenta, a fennel salad, or a broad ribbon pasta, such as pappardelle.